Panthers historically ranged across the southeastern United States including Arkansas, Louisiana, Mississippi, Alabama, Georgia, Florida, and parts of Tennessee and South Carolina. 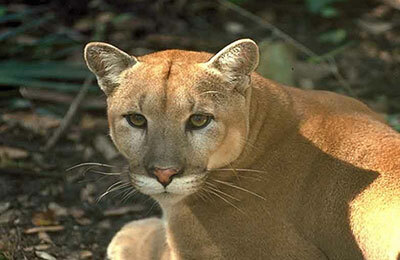 Now, the breeding population of Florida panthers is found only in the southern tip of Florida, south of the Caloosahatchee River. In recent years, young male panthers have traveled north into central and northeast Florida, and one even dispersed to west-central Georgia near the Alabama border. Females do not roam as widely and none have been documented outside of south Florida in decades. Behavior: Panthers are habitat generalists, which means they use a variety of habitat types, including forests, prairies and swamps. They are solitary and territorial animals that travel hundreds of miles within their home ranges. Panthers are mostly active between dusk and dawn, resting during the heat of the day. Males have a home range on average of 200 square miles and females about 75 square miles. Panthers are usually quiet, but they do communicate through vocalizations that have been described as chirps, peeps, whistles, purrs, moans, screams, growls, and hisses. Females signal their readiness to mate by yowling or caterwauling.